It is a bit of a misnomer to say that a 1:1 system has mechanical advantage, because it doesn't. For each unit of mass that you raise you will have to pull an equal amount of force. 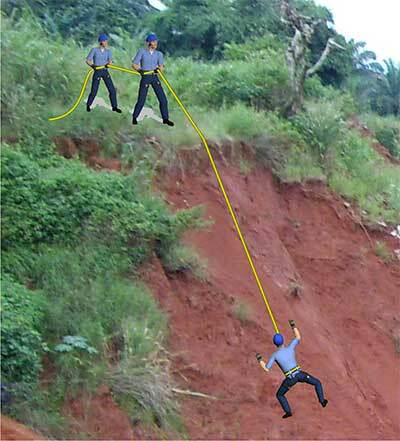 And if the rope runs through any pulleys or across rough terrain, you will have to pull even more due to friction. That said, there are times when a 1:1 system is the perfect choice. This includes when the load isn't very heavy (e.g., on a low-angle slope where the rescuer or victim can scramble while being pulled) or when you have plenty of pulling power. As shown in this next illustration, a change of direction (i.e., "COD") pulley can be added to an anchor. When a pulley is added to the anchor, it doesn't change the mechanical advantage (in fact, the pulley reduces the advantage slightly due to friction), but a change of direction pulley does allow you to pull in a different direction. A different direction can be advantageous by allowing rescuers to pull downhill, work in an area with more room, work in safer terrain, etc. As explained in the physics section, COD pulleys can increase the load on the anchor. The above systems are functional, but they can't survive the infamous "whistle test." To add this level of safety, a "progress capture device" is often added to a pulley that is near the anchor. As the pullers make "progress" by raising the load, the capture device functions like a one-way ratchet, making sure the progress that has been made can't be lost. The simplest form of a progress capture device is to install Prusiks on the load-side of the pulley. A pulley with "Prusik minding" side plates will ensure that the Prusik can't get sucked into the pulley while raising. 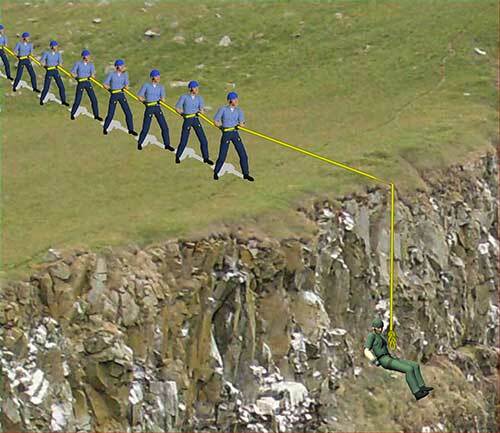 If the rescuers let go (e.g., somebody blows the proverbial whistle, or lightening strikes and they all fall down), the Prusiks will grab the rope and prevent the load from falling. Optionally, there are specialized devices that provide progress capture functionality without requiring a Prusik hitch.